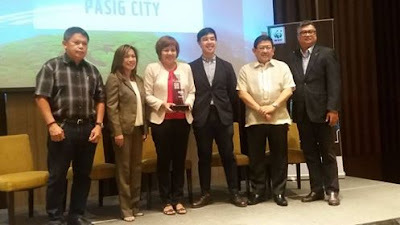 Leading experts within the field of urban sustainability around the world have proclaimed Pasig City as the Philippine National Capital of the 2017-2017 edition of World Wide Fund for Nature’s (WWF) One Planet City Challenge (OPCC), a biennial global challenge that recognizes cities for developing infrastructure, housing, transport and mobility solutions to power the global transition to a low-carbon, climate-resilient future. This edition saw 133 cities representing 23 countries accepting the Challenge. Pasig’s concrete and comprehensive actions to reduce its carbon emissions, particularly its plan to reduce traffic emissions and congestions as well as its targeted actions around renewable energy and energy efficiency, truly reflected the “sustainable transport and mobility” theme of this run of the OPCC and have made the city eligible for the Global OPCC Prize, which will be awarded in September. The jury also particularly appreciated the city’s strong community engagement and its adaptation actions, such as the cleaning of the Pasig River and its strong alignment of actions to emissions reduction and execution of said actions. Seven other Philippine cities, namely Batangas, Catbalogan, Makati, Parañaque, San Carlos, Tagum, and Zamboanga have successfully qualified to join the 2017-2018 OPCC based on the criteria announced early in 2017. The cities of Makati, Pasig, and San Carlos went on to become national finalists and participated in the “We Love Cities” global campaign from May 7 until the end of June 2018. The City of Jakarta bagged the top plum in the campaign, which is a social media contest that is aimed at inspiring and engaging the respective citizens of the national finalists across the globe for support, votes, and ideas for improvement while Pasig came in second. Launched in 2011 as the Earth Hour City Challenge, the OPCC highlights the crucial role that cities play in the transition toward a low-carbon and sustainable future. Since then, over 400 countries from 5 continents have heeded the call to sustainably address fast and large transformations in population, consumption patterns, resource use, and waste management. The Philippines joined the Challenge in its 2015-2016 run. The awarding ceremony for the OPCC national winner, finalists, and qualifiers of the Philippines was held at Marco Polo Ortigas as part of WWF-Philippines’ two-day workshop entitled One Planet Cities: Raising Climate Ambitions and Sustainability Actions for 1.5°C. 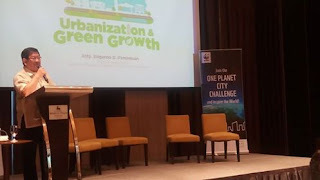 Said workshop brought together cities from all over the country to further discuss ways in which they can work together towards the country’s Nationally Determined Contributions (NDC) to meet the Paris Agreement’s goal of keeping global warming to 1.5°C. Updates on the progress of the Philippine government on its commitment to the Paris Agreement, as well as other framework plans addressing climate change and sustainable urban development. Insights from panelists coming from various sectors steered the tackling of the status of the Local Climate Change Action Plan (LCCAP) compliance of local government units, especially in the urban setting. Challenges being faced by both the national government and the cities in the implementation of their respective LCCAPs were also mapped out with the help of workshop facilitators from WWF-Philippines. Visit www.panda.org/opcc and http://www.welovecities.org/ for further details on the One Planet City Challenge and We Love Cities.